It’s that time of year again! I’m updating this for October 2018. 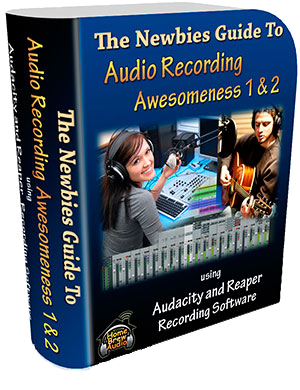 Creating interesting and even spooky sounds is super easy with a computer-based home recording studio. Its fun to experiment with not just interesting sounds, but scary ones as well, maybe for sound design purposes or for your Halloween antics. 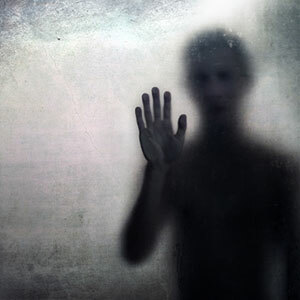 One of the creepiest sounds there is – too me anyway – is the ghostly reverse reverb effect on a voice. It has often been used in scary movies for the speech of ghosts or other supernatural or otherwise other-worldly characters. Here are tips on creating that effect for your own voice (or music) – using Reaper software. The process is the same for any software though. In Reaper, start by recording your voice talking for a few seconds – maybe saying something creepy. Then right-click on the item and select reverse item as new take. Now the voice is backwards. If it sounds like “Paul is dead,” that truly IS creepy;). Next, apply a reverb effect to the track (in the below sample I just used the built-in Reaper effect called ReaVerb and chose the “sweetverbo” preset), and render the result as a new file. Either select the add items to new tracks in project when finished box while rendering, or just insert the rendered file back into your project using Insert/Media file. Now you’ve got a backwards vocal with a regular reverb on it in your project on a 2nd track. The 1st track has the original file on it so be sure to must that track at this point (or just delete it). 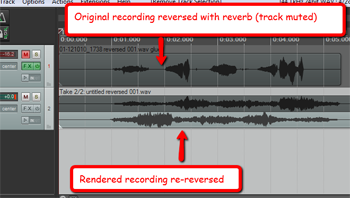 Reverse that audio again (right-click on the item and select reverse item as new take), and the reverb will be “backwards.” And you’ll have a ghostly version of your voice. You can use this effect in a non-Halloween way too, of course. It’s often used for drum hits and just as an interesting effect on vocals. My most recent favorite use of this is in the Sara Bareilles song, Satellite Call, from her album, The Blessed Unrest. For things like drum hits, it’s a lot easier to do because you can simply render the drum hit with a reverb applied, and then reverse that. It doesn’t matter that the drum hit is “backwards.” But if you tried to do it that way with a voice, it would be unintelligible because it would be backwards, and people would think it was instructions from the devil or something (a la the myths on rock records in the 60s and 70s). Come to think of it, that could have its own spooky uses :-P.
Have fun scaring the kiddos on Halloween!